You see all of these great icons sporting an effortless fringe — Zooey Deschanel, Katy Perry, Lily Allen, Audrey Hepburn... — and you think "all I need to impart that sort of look is cutting a bit of hair across the forehead". The question is: can you actually manage it at home? This question seems to cross our minds every time we consider a new haircut, and sometimes it stops us from getting the style we always wanted. Well, don't let that happen. If you really want something, learn how to get on with it. Let's start with something simple today: fringe (a.k.a. bangs). Most people do struggle with this particular style, because of it's common issues: it parts in the middle or it's not laying flat (or maybe it's laying too flat?). One lesson well learnt, for me, was: put down the flat iron! A hair dryer is the right tool for this job, but bare in mind, timing is everything. Before we get to the styling bit, let's analyze the cut, shall we? Make sure you let the stylist know if you want straight across bangs or rounded ones, a long fringe that completely covers the brows or a short vintage-looking one. Also, decide beforehand if you like the longer bits on the sides. And, with thick hair, make sure there's some thinning out action. Right, now that the cut is sorted, let's get on with it. 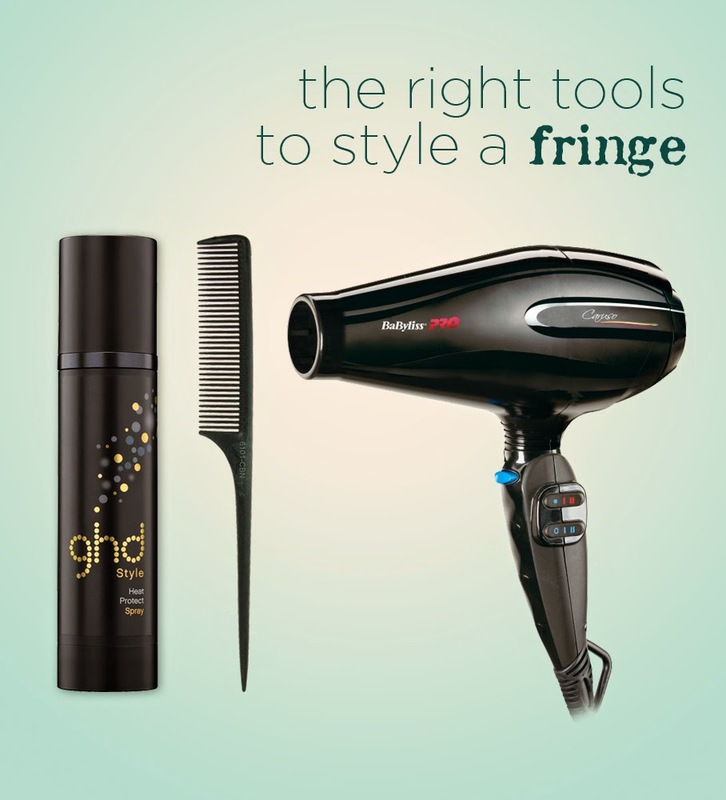 Get used to blow-drying your fringe right after the shower. This is especially important if your hair isn't naturally pin-straight or if you have any whorls (cowlicks) at the front. To get right into the roots, dismiss that rounded brush. Pick up a fine tooth comb — making sure it has soft rounded edges, to avoid any damage on the scalp — and comb the hair from side to side, with the nozzle of the dryer on top. Not too close, though! Drying in different directions "disorients" the hair parting (or the whorl), making it fall straight down to the front. Before drying the hair, if you usually apply any sort of styling cream, do apply a tiny bit on the fringe (avoiding the roots) in order to get a polished result. And don't forget to spritz some heat protecting spray! If you find that your cowlick is very persistent, and it tends to lift back up when the hair cools down, wear a hairband right after styling it, for about 10 to 20 minutes, until the hair sets. And, when you just don't have the time or the patience to manage it, simply braid it or pin it back!